For the lake in Kangra district (Himachal Pradesh), see Dal Lake (Himachal Pradesh). 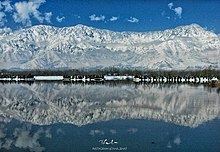 Reflection of snow covered Zabarwan Range in the Dal lake. 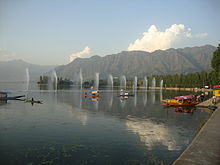 Dal is a lake in Srinagar, the summer capital of Jammu and Kashmir, India. The urban lake, which is the second largest in the state, is integral to tourism and recreation in Kashmir and is named the "Jewel in the crown of Kashmir" or "Srinagar's Jewel". The lake is also an important source for commercial operations in fishing and water plant harvesting. The shore line of the lake, is about 15.5 kilometres (9.6 mi), is encompassed by a boulevard lined with Mughal era gardens, parks, houseboats and hotels. Scenic views of the lake can be witnessed from the shore line Mughal gardens, such as Shalimar Bagh and Nishat Bagh built during the reign of Mughal Emperor Jahangir and from houseboats cruising along the lake in the colourful shikaras. During the winter season, the temperature sometimes reaches −11 °C (12 °F), freezing the lake. The lake covers an area of 18 square kilometres (6.9 sq mi) and is part of a natural wetland which covers 21.1 square kilometres (8.1 sq mi), including its floating gardens. The floating gardens, known as "Rad" in Kashmiri, blossom with lotus flowers during July and August. The wetland is divided by causeways into four basins; Gagribal, Lokut Dal, Bod Dal and Nigeen (although Nigeen is also considered as an independent lake). Lokut-dal and Bod-dal each have an island in the centre, known as Rup Lank (or Char Chinari) and Sona Lank respectively. At present, the Dal and its Mughal gardens, Shalimar Bagh and the Nishat Bagh on its periphery are undergoing intensive restoration measures to fully address the serious eutrophication problems experienced by the lake. Massive investments of approximately US$275 million (₹ 11 billion) are being made by the Government of India to restore the lake to its original splendour. Dal is mentioned as Mahasarit (Sanskrti-महासरित्) in ancient Sanskrit texts. Ancient history records mention that a village named Isabar to the east of Dal was the residence of goddess Durga. This place was known as Sureshwari on the bank of the lake, which was sourced by a spring called the Satadhara. During the Mughal period, the Mughal rulers of India designated Kashmir, Srinagar in particular, as their summer resort. They developed the precincts of the Dal in Srinagar with sprawling Mughal-type gardens and pavilions as pleasure resorts to enjoy the salubrious cool climate. After the death of Aurangzeb in 1707, which led to the disintegration of the Mughal Empire, Pashtun tribes in the area around the lake and city increased, and the Afghan Durrani Empire ruled the city for several decades. In 1814 a significant part of the Kashmir valley, including Srinagar, was annexed from the Afghans by Raja Ranjit Singh to his kingdom, and the Sikhs grew in influence in the region for 27 years. During the Dogra Raj, Srinagar became the capital of Dogra dynasty, attracted by the cool climate of the Kashmir valley, amidst the back drop of the majestic snow covered Himalayan ranges. The lake precincts experience temperatures in the range of 1–11 °C (34–52 °F) during winter and 12–30 °C (54–86 °F) during the summer season. The lake freezes when temperatures drop to about −11 °C (12 °F) during severe winter. Although the Dogra Maharaja of Kashmir restricted the building of houses in the valley, the British circumvented this rule by commissioning lavish houseboats to be built on the Dal. The houseboats have been referred to as, "each one a little piece of England afloat on Dal." After the independence of India, the Kashmiri Hanji people have built, owned and maintained these houseboats, cultivating floating gardens and producing commodities for the market, making them the centre of their livelihoods. The houseboats, closely associated with Dal also provide accommodation in Srinagar. Following the Mughal, Afghan, Sikh and Dogra rule, the place has earned the epithet, "Jewel in the crown of Kashmir". A picturesque sunset scene at Dal Lake as seen from the vantage point of Nishat Bagh. The lake is located within a catchment area covering 316 square kilometres (122 sq mi) in the Zabarwan mountain valley, in the foothills of the Shankracharya hills, which surrounds it on three sides. The lake, which lies to the east and north of Srinagar city covers an area of 18 square kilometres (6.9 sq mi), although including the floating gardens of lotus blooms, it is 21.2 square kilometres (8.2 sq mi) (an estimated figure of 22–24 square kilometres (8.5–9.3 sq mi) is also mentioned). The main basin draining the lake is a complex of five interconnected basins with causeways; the Nehru Park basin, the Nishat basin, the Hazratbal basin, the Nigeen basin and the Barari Nambal basin. Navigational channels provide the transportation links to all the five basins. The average elevation of the lake is 1,583 metres (5,194 ft). The depth of water varies from 6 metres (20 ft) at its deepest in Nigeen lake to 2.5 metres (8.2 ft), the shallowest at Gagribal. The depth ratio between the maximum and minimum depths varies with the season between 0.29 and 0.25, which is interpreted as flat bed slope. The length of the lake is 7.44 kilometres (4.62 mi) with a width of 3.5 kilometres (2.2 mi). The lake has e basin hava shore length of 15.5 kilometres (9.6 mi) and roads run all along the periphery. Irreversible changes through urban developments have placed further restrictions on the flow of the lake and as a result, marshy lands have emerged on the peripheral zones, notably in the foothill areas of the Shankaracharya and Zaharbwan hills. These marshy lands have since been reclaimed and converted into large residential complexes. Multiple theories explaining the origin of this lake have been formulated. One version is that it is the remnants of a post-glacial lake, which has undergone drastic changes in size over the years and the other theory is that it is of fluvial origin from an old flood spill channel or ox-bows of the Jhelum River. The dendritic drainage pattern of the catchment signifies that its rock strata have low levels of porosity. Lithologically, a variety of rock types have been discerned namely, igneous, metamorphic and sedimentary. The Dachigam Telbal Nallah system is conjectured to follow two major lineaments. Discontinuous surfaces seen in the terrain are attributed to the angular and parallel drainage pattern. The water table cuts the hill slopes, which is evidenced by the occurrence of numerous springs in the valley. Seismic activity in the valley is recorded under Zone V of the Seismic Zoning Map of India, the most severe zone where frequent damaging earthquakes of intensity IX could be expected. In the year 2005, Kashmir valley experienced one of the severe earthquakes measured at 7.6 on the Richter's scale, which resulted in deaths and the destruction of many properties, leaving many homeless. The shallow, open-drainage lake is fed by Dachigam-Telbal Nallah (with perennial flow), Dara Nallah ('Nallah' means "stream") and many other small streams. The lake is classified as 'warm monomictic' under the sub-tropical lake category. Spring sources also contribute to the flow, although no specific data is available to quantify their contribution. To address this, water balance studies to analyse and assess the characteristics of flow have been conducted in order to approximate the discharge contributed by the springs in the lake bed. The complex land use pattern of the valley is reflected in the urbanised Srinagar in its north, with rice fields, orchards and gardens in the lower slopes, and barren hills beyond steep sloping hills. The flat topography also affects drainage conditions. It receives an average annual rainfall of 655 millimetres (25.8 in) in the catchment, but during the summer, snow melt from the higher ranges of the catchment results in large inflows into the lake. The maximum flood discharge of Telbal Nallah has been assessed as 141.5 metres3/s for a one in hundred return period; the 1973 observed flood in Telbal Nallah has been estimated as 113 metres3/s. The average annual flow, according to discharge measurements, has been estimated as 291.9 million cubic metres, with Telbal Nalah accounting for 80% of the total and 20% contributed by other sources. The silt load has been estimated at 80,000 tonnes per year with 70% contribution from the Telabal Nallah, with 36,000 tonnes recorded as settling in the lake. There are two outlets from the lake, namely the Dalgate and Amir Khan Nallah that connects the lakes of Nigeen and Anchar Lake. Dalgate is controlled by a weir and lock system. The outflow from these two outlets has been estimated as 275.6 million cubic metres. The ecosystem of Dal is ecologically rich in macrophytes, submerged macrophytes, floating macrophytes and phytoplankton. Macrophyte flora recorded in the lake's aquatic and marshland environment consists of 117 species, belonging to 69 genera and 42 families. The lake is noted in particular for its Nelumbo nucifera (lotus flowers) which bloom in July and August. The prolific growth of Ceratophyllum demersum in the eutrophic zones has been reported, with Myriophyllum spicatum and Potemogetton lucens cited as dominant species. Other macrophytes discerned in different zones of the lake include Typho angustata, Phragmites australis, Myriophyllum, Sparganium evectum and Myriophyllum verticillatum, which contribute to the production of macrophites. The rooted variety of the floating leaf type consists of Nelumbo nucifera, Nymphaea alba, N. tetragonia, N. candida, Nymphoides peltata, Salvinia natans, Hydrocharis dubia, Nymphaea sp. and Potamogeton natans, all of which occupy 29.2% of the lake. Phytoplanktons include Navicula radiosa, Nitzschia accicularis, Fragilaria crotonensis, Diatoma elongatum, Scenedesmus bijuga, Pediastrum duplex, Tetraedron minimum, Microcystis aeruginosa and Merismopedia elegans. Since 1934, some important changes have been observed in the lake's biota, including a reduction in the number of Chara species, and an increase in the area covered by Salvinia since 1937. Analysis of the lake has also revealed the tendency for it to develop monospecific communities of submerged macrophytes such as Ceratophyllum and Myriophyllum. Woody vegetation in the catchment of the lake consists of Melia, Ailanthus, Robinia, Daphne, Celtis, Rose, Ephedra, Pinus roxburghii, Pinus halepensis, Pinus gerardiana, Cupressus torulosa and Cupressus arizonica. The valley also has a rich cultivation of crops such as paddy, wheat and fodder. Floating gardens, labelled the 'Rad' in tye Kashmiri language are a special feature of the lake. They basically constitute of matted vegetation and earth, but are floating. These are detached from the bottom of the lake and drawn to a suitable place (generally to the north west of the houseboats' location) and anchored. Given its rich nutrient properties, tomatoes, cucumbers and melons are grown with noteworthy results. The faunal distribution consists of Zooplanktons, Benthos and Fish. Zooplankton found in the lake include Keratella cochlearis, K. serrulata, Polyactis vulgaris, Brachionus plicatilis, Monostyla bulla, Alona monocantha, Cyclops ladakanus and Mesocyclops leukarti. Benthos include Chironomus sp. and Tubifex sp. and fish include Cyprinus carpio specularis (economically important), C. carpio communis, Schizothorax niger, S. esocinus, S. curviformis and Crossochelius latius. It is also reported that Cyprinus, introduced during early sixties, is dominant and that the indigenous species Schizothorax is showing a declining trend. The lake is warm monomictic (mixing type) and the pH value recorded has varied from a minimum of 7.2 to a maximum of 8.8 on the surface over a yearly period. The Dissolved oxygen [mg l−1] value has varied from a minimum of 1.4 to a maximum of 12.3 on the surface within a year. The Recorded maximum nitrogen concentration (NH4-N [micro l−1] has been recorded as 1315 on the surface and 22 at the bottom of the lake. Phosphorus concentration expressed in Total-P [micro l−1] has varied from a high of 577 to a low of 35 during the 12 months of the year. The lake water temperature has varied from a minimum of 3 °C (37 °F) in January to 26 °C (79 °F) in June at the surface. Transparency, expressed as depth in metres, has varied from a maximum of 1.95 metres (6.4 ft) in July to a minimum of 0.53 metres (1.7 ft) in March, over the 12 months period. Studies of the water quality of the lake in 1983–84 indicate a decline in quality since the 1965–66 analysis. Scientific research over the years also reveal that Telbal, Botkal, and sewage drains are responsible for a substantial influx of nitrogen and phosphorus into the lake. Quantitatively, fifteen drains and several other sources have released a total of 156.62 tonnes (56.36 tonnes by drains alone) of phosphorus, and 241.18 tonnes of inorganic nitrogen into the lake from a discharge of 11.701 million cubic metres /year. Non-point sources, such as seepage and diffused runoff, also add to this pollution and have been recorded as further adding 4.5 tonnes of total phosphates and 18.14 tonnes of nitrogen (NO3–N and NH4–N) to the lake. Based on the values mentioned above, it has been inferred that the water quality of the lake has deteriorated. The major environmental problem facing the lake is eutrophication, which has required immediate remedial measures to combat it. Alarmingly, the size of the lake has shrunk from its original area of 22 square kilometres (8.5 sq mi) to the present area of 18 square kilometres (6.9 sq mi), and there is a concerning rate of sediment deposition due to catchment area degradation. The water quality has also deteriorated due to intense pollution caused by the untreated sewage and solid waste that is fed into the lake from the peripheral areas and from the settlements and houseboats. Besides, some experts like Dr. A.A. Kazmi (Associate Professor, IIT Roorkee and in charge of the Environmental Engineering Lab) believe that deforestation in the catchment of Dal and Telbal stream may have led to more nitrogen and phosphorus-rich run-off, further aiding eutrophication. Encroachments of water channels and consequent clogging has diminished the circulation and inflows into the lake, so with the building up of phosphates and nitrogen, this has led to extensive weed growth and consequences on the biodiversity of the lake. Identifying the above major issues as causes for the deterioration of the lake, a multidisciplinary team of experts have prepared a Detailed Project Report (DPR), which has the objective of achieving environment and sustainability, ecological improvement with minimum interventions and displacement and balancing the conflicts of interest. This plan is now under implementation with the financial assistance of the Government of India. The serious nature of the environmental problems the lake has been experienced has been widely publicised and has been brought to the attention of the Supreme Court of India. Public Interest Litigations (PILs) have been filed in court demonstrating the environmental dangers posed to the lake by sewage, wastes and effluents. The PILs have sought injunctions of the court for setting up of an integrated ring sewage system encircling the Lake; release of funds by the Government of India to undertake measures to check pollution and to inaugurate a High Powered Committee to monitor proper utilisation of the allotted funds. The committee is under obligation to post feedback of progression developments from time to time, directly to the Supreme Court. The PIL, filed in 2001, has resulted in a number of directives from the court to the funding and implementing agencies and the case is continuing. Consequently, under the National Lake Conservation Plan of the Ministry of Environment and Forests of the Government of India, funds to the extent Rs 2987.6 million were sanctioned in September 2005 for the conservation of the lake. The restoration and rehabilitation measures envisaged under the "Conservation and Management of Dal" are under various stages of implementation with the funds allocated by the Government of India for the purpose. Some of the measures undertaken for rehabilitating the lake to bring it to its original eutrophication free status involved measures such as construction of siltation tanks, mechanical deweeding, regrouping of houseboats, deepening of outflow channel and removal of bunds and barricades, including some floating gardens. In addition, a moratorium has been imposed on new construction works close to the lakefront, including the building of new house boats. Resettlement plans for migrating the population from the lakefront have also evolved. The long-term development plans also deal with the reafforestation of catchment area to reduce erosion movement and movement of silt and to regulate grazing by livestock. Recent reports indicate that, as of 2010, 40% of the measures have been implemented. The lake is popular as a visitor attraction and a summer resort. Fisheries and the harvesting of food and fodder plants are also important on Dal. Weeds from the lake are extracted and converted into compost for the gardens. It also serves as a flood lung of the Jhelum River. Swimming, boating, snow skiing (particularly when the lake is frozen during the severe winter), and canoeing are amongst some of the water sports activities practised on the lake. 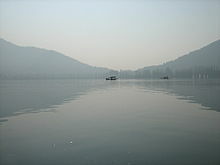 The lake has numerous sites and places of interest, many of which are important to the cultural heritage of Srinagar. Aside from the Shalimar Bagh and Nishat Bagh, some of the other places frequented by tourists are the Shankaracharya temple, the Hari Parbat, the Nigeen Lake, the Chashme Shahi, the Hazratbal Shrine, and the Mazar-e-Shura cemetery containing the graves of famous Mughal-era poets. Visitors and native alike also enjoy relaxing on the water in a houseboat or a shikara boat, often called "the Gondola of Kashmir". 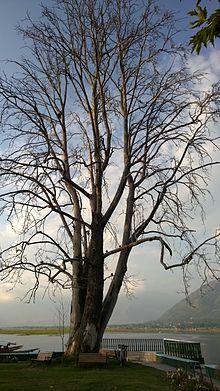 A famous landmark in Srinagar is an island on Dal where four Chinar (Platanus orientalis) trees stand, named "Char Chinar". Char in Hindi and Urdu means four. Nigeen Lake, though sometimes referred to as a separate lake, is actually part of Dal, being linked through a causeway which permits only bikers and walkers to enter the lake precincts. The caseway carries the water supply pipeline to the Srinagar city in the east. The lake is bounded by the Shankaracharya hill (Takht-e-Suleiman) on the south and Hari Parbat on the west and is located at the foot of the Zabarwan hills. Willow and poplar trees flank the edges of the lake. Chashme Shahi, meaning "Royal Spring", is a fresh water spring and garden known for its medicinal properties. Its source located above the Nehru Memorial Park. 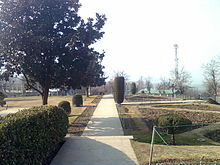 It is the smallest of all the Mughal gardens in Srinagar, measuring 108 metres (354 ft) x 38 metres (125 ft) and it has three terraces, an aqueduct, waterfalls and fountains. Ali Mardan Khan built the garden in 1632, and is built in such a way that the spring water is the source of fountains. From the fountains, water flows along the floor of the pavilion and cascades to a lower terrace over a drop of 5 metres (16 ft) along a polished black stone chute. A small shrine, known as the Chasma Sahibi, is located in the vicinity of the gardens and has a fresh water spring. The sacred Shankaracharya temple, also known as Jyeshteswara, occupies the top of the hills (about 1,000 feet (300 m) above the surrounding Takht-I-Sulaiman plains in the south-east of Srinagar. The site, initially named Gopadri, dates back to 250 BC as a Buddhist monument, probably built by Emperor Ashoka's son Jhaloka. In the 7th century it was replaced by the present temple by King Lalitaditya. The philosopher Shankaracharya is documented as having stayed at this place when he visited Kashmir ten centuries ago to revive Sanātana Dharma. Hari Parbat, also known as the Mughal fort, is a hill fort on Sharika hill that provides panoramic views of the Srinagar city and the Dal. It was first established by Mughal Emperor Akbar in 1590. However, he only erected the outer wall of the fort and his plans to build a new capital called Naga Nagor within it did not materialise. The fort in its current state was built much later in 1808 under the reign of Shuja Shah Durrani. Within the fort's precincts are temples, Muslim shrines, and a Sikh Gurudwara. The hill is the subject of many legends in Hindu mythology, and was said to have once been a large sea, inhabited by a demon known as Jalobhava and that the hill grew from a pebble. The Hazratbal Shrine (Urdu: حضرت بل‎, literally: Majestic Place), also named Hazratbal, Assar-e-Sharief, or simply Dargah Sharif, is a Muslim shrine situated on the left bank of the Dal and is considered to be Kashmir's holiest Muslim shrine. It contains a relic believed by many Kashmiri Muslims to be the Moi-e-Muqqadas, a hair from the head of the Islamic prophet Muhammad. According to legend, the relic was first brought to India by Syed Abdullah, a descendant of Muhammad who left Medina and settled in Bijapur, near Hyderabad in 1635. When Syed Abdullah died, his son, Syed Hamid, inherited the relic. Following the Mughal conquest of the region, Syed Hamid was stripped of his family estates. Finding himself unable to care for the relic, he gave it as the most precious gift to his close Mureed and a wealthy Kashmiri businessman, Khwaja Nur-ud-Din Ishbari. Mazar-e-Shura (Kashmiri: मज़ार-ए-शायरा, Urdu: مزارِ شُعاراء‎; transliteration: Mazār-i Shuʿārā, translation: The Cemetery of Poets) is a cemetery on a small hill by the main road in Dalgate, an area of Srinagar, Jammu & Kashmir in India. Founded in the reign of the Mughul emperor Akbar the Great, it was built in a scenic location on the banks of the Dal as a cemetery for eminent poets. 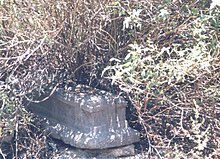 Historical records show that there were at least five poets and men of letters buried in the cemetery: Shah Abu'l-Fatah, Haji Jan Muhammad Qudsi, Abu Talib Kalim Kashani, Muhammad Quli Salim Tehrani, and Tughra-yi Mashhadi, all natives of Iran who emigrated to India and were associated with the Mughal court. Due to neglect, only three tombstones are currently visible, one of which bears an inscription that is only partially legible. Houseboats and the Dal are widely associated with Srinagar and are nicknamed "floating palaces", built according to British customs. The houseboats are generally made from local cedar-wood and measure 24–38 metres (79–125 ft) in length and 3–6 metres (9.8–19.7 ft) in width and are graded in a similar fashion to hotels according to level of comfort. Many of them have lavishly furnished rooms, with verandas and a terrace to serve as a sun-deck or to serve evening cocktails. They are mainly moored along the western periphery of the lake, close to the lakeside boulevard in the vicinity of the Dal gate and on small islands in the lake. They are anchored individually, with interconnecting bridges providing access from one boat to the other. The kitchen-boat is annexed to the main houseboat, which also serves as residence of the boatkeeper and his family. Each houseboat has an exclusive shikara for ferrying guests to the shore. A shikara is small paddled taxi boat, often about 15 feet (4.6 m) long) and made of wood with a canopy and a spade shaped bottom. It is the cultural symbol of Kashmir and is used not only for ferrying visitors but is also used for the vending of fruits, vegetables and flowers and for the fishing and harvesting of aquatic vegetation. All gardens in the lake periphery and houseboats anchored in the lake are approachable through shikaras. The boats are often navigated by two boatmen dressed in "Phiron" (traditional dress) and carry 'Kangris' or portable heaters on the boat. A shikara can seat about six people and have heavily cushioned seats and backrests to provide comfort in Mughul style. All houseboat owners provide shikara transport to their house guests free of charge. The shikara is also used to provide for other sightseeing locations in the valley, notably a cruise along the Jhelum River, offering scenic views of the Pir Panjal mountains and passing through the famous seven bridges and the backwaters en route. Dal lies in heart of the Srinagar city and is well connected by road and air links. The nearest airport, which connects with other major cities in the country, is about 7 kilometres (4.3 mi) away at Badgam. The nearest railway station is Srinagar railway station which is 18.8 kilometres (11.7 mi) from Dal Lake. The National Highway NH1A connects the Kashmir valley with rest of the country. Shikaras provide a water taxi service available to see the sights in the Dal and to approach the houseboats moored on the lake periphery. ^ "Dal Lake". National Informatics Centre. Archived from the original on 25 July 2009. Retrieved 3 April 2010. The world famous water body has been described as Lake Par-Excellence by Sir Walter Lawrence. It is the Jewel in the crown of the Kashmir and is eulogised by poets and praised abundantly by the tourists. 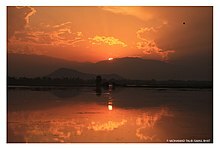 ^ a b c d e f g h i j k l m n o p q r s t u v "Dal Lake". International Lake Environment Committee. Archived from the original on 9 May 2012. Retrieved 18 December 2009. ^ a b c d e f g h i Jain, Sharad K; Pushpendra K. Agarwal; Vijay P. Singh (2007). Hydrology and water resources of India. Dal Lake. Springer. p. 978. ISBN 1-4020-5179-4. Retrieved 27 December 2009. ^ "DAL LAKE". Tourist Attractions in India. ^ a b c d the Alternate Hydro Energy centre of the University of Rookee. "Conservation and Management Plan for Dal- Nigeen Lake". House Boat Owners Association. Archived from the original on 9 May 2012. Retrieved 27 December 2009. ^ a b c "Dal Lakes". Kashmir Tourism. Retrieved 18 December 2009. ^ a b c "Restoring the Dal Lake to its original glory". Rediff.com. 1 July 2009. Retrieved 18 December 2009. ^ a b "Surfacae tension" War over city lakes is heating up" (PDF). Rainwaterharvesting.org. Retrieved 25 December 2009. ^ a b Bindloss, Joe; Sarina Singh (2007). India. Srinagar. Lonely Planet. pp. 353–354, 360. ISBN 1-74104-308-5. Retrieved 29 December 2009. it is a very beautiful lake. ^ a b Singh, Sarina (2005). Lonely Planet India. Lonely Planet. p. 342. ISBN 978-1-74059-694-7. ^ Schimmel, Annemarie; Waghmar, Burzine K. (2004). The Empire of the Great Mughals: History, Art and Culture. Reaktion Books. p. 77. ISBN 1-86189-185-7. Retrieved 6 April 2010. ^ Muhyi'd Dīn Sūfī, Ghulām (1974). Kashīr, Being a History of Kashmir from the Earliest Times to Our Own. 1. Light & Life Publishers. p. 297. ^ Singh, Gulcharan (1976). Ranjit Singh and his generals. Sujlana Publishers. p. 62. ^ Singh, Sarina (2005). India, Lonely Planet India. Kashmir. Lonely Planet. p. 342. ISBN 978-1-74059-694-7. Retrieved 28 December 2009. ^ "House Boats on Dal Lake". House Boats in Kashmir. Archived from the original on 8 March 2007. Retrieved 28 December 2009. ^ "The Vale of Kashmir". California House Boats. Archived from the original on 9 May 2012. ^ The Alternate Hydro Energy <SOUMYA AND AKHIL> centre of the University of Rookee. "Geological Aspects". House Boat Owners Association. Archived from the original on 9 May 2012. Retrieved 27 December 2009. ^ The Alternate Hydro Energy centre of the University of Rookee. "Hydrology and water Balance Studies". House Boat Owners Association. Archived from the original on 9 May 2012. Retrieved 27 December 2009. ^ a b c d "Dal Lakes". Retrieved 29 December 2009. ^ "Dal Lake". Eco India. Retrieved 3 April 2010. ^ Sakahare, Vishwas B. (2007). Applied Fisheries. Daya Books. pp. 68–70. ISBN 978-81-7035-482-6. Retrieved 3 April 2010. ^ a b The Alternate Hydro Energy centre of the University of Rookee. "Data Collection and Analysis". House Boat Owners Association. Archived from the original on 9 May 2012. Retrieved 27 December 2009. ^ a b c d e f "Srinagar Attractions: Nigeen Lake". Archived from the original on 4 May 2010. Retrieved 28 December 2009. ^ a b "Kashmir. Temple of Jyeshteswara (Shankaracharya)". British on Line Gallery. Retrieved 28 December 2009. 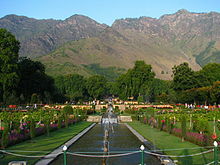 ^ "Srinagar Attractions: Mughal gardens". Archived from the original on 4 May 2010. Retrieved 28 December 2009. ^ "Srinagar and its Environs". Retrieved 30 December 2009. ^ a b "Kashmir – The Secret Garden". Archived from the original on 13 February 2010. Retrieved 29 December 2009. ^ Lyon, Jean (1954). Just half a world away: my search for the new India. Crowell. p. 370. Retrieved 29 December 2009. ^ "Dal Lake". Government of Jammu and Kashmir. Archived from the original on 2 December 2009. Retrieved 31 December 2009. Pandit, Ashok K. (1999). Freshwater ecosystems of the Himalaya. Dal Lake Ecosystem. Informa Health Care. ISBN 1-85070-782-0. Wikimedia Commons has media related to Dal Lake.